After completing his engineering technology diploma, Trevor Smith worked in Ontario for a few years, but he was quickly drawn back to Newfoundland and Labrador with an amazing opportunity as a Power System Operator apprentice. And now he works in an exciting career with a great group of people who are way more than just coworkers. Is Power System Operator the career for me? Then maybe you want to think about becoming a Power System Operator. What does a Power System Operator do? Power System Operators monitor and operate the electrical system on a day-to-day basis. They work from a central control centre monitoring, regulating, and controlling electrical generation and transmission, terminal stations, and distribution equipment—basically they keep the energy flowing smoothly. Talk about a job people rely on! If there is an issue like an outage, Power System Operators coordinate the response to customer trouble calls and inquiries. They make sure crews are dispatched to repair the line or equipment. And they make sure equipment is powered down so it can be safely repaired to restore power. 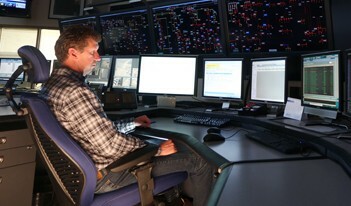 Power System Control Centres are primarily located in urban areas. Hydro and Newfoundland Power are the primary employers of Power System Operators. What training do I need to become a Power System Operator? Where can this career lead me? After you complete an apprenticeship with a company, you earn a Journeyperson Power System Operator certificate. From there you can continue on your career path as a Hydro Plant Operator, or become a Power System Operator. As you gain experience as a Power System Operator, you can grow into Lead and Senior Power System Operator roles, and eventually Supervisor/Superintendent positions.